"The President is basing his decisions on some really bad information right now. And if you shut me out, your family, and my family, and 25 million other families will be dead in 30 minutes." Oh, if only this has been made in the mid-'90s with Harrison Ford's name above the credits and Philip Noyce planted firmly behind the camera. Then we might have gotten a decent adaptation of one of Tom Clancy's most solid efforts. Actually, given the box office success of the two Harrison Ford Jack Ryan thrillers, it's strange that Paramount wasn't keen on following up with a third Ford-as-Ryan movie. It's almost impossible to place a finger on any one detail signifying why The Sum of All Fears doesn't work. But it doesn't. Not even a little. Until this film, which I personally don't consider part of the series, the Jack Ryan thrillers each possessed credibility and believability. They felt rooted in reality and that gave them a lot of distinction amongst their peers in the genre. But there's never a moment where the same can be said of The Sum of All Fears. Instead of reality you have a script rooted in spineless political correctness, were the villains are so cartoonish they might as well wear top hats and capes and twirl their moustaches while tying damsels to train tracks. The script, adapted by Daniel Pyne and Paul Attansasio, shaves 20 years off the life of Jack Ryan. This time he's an up-and-coming CIA analyst tasked with providing a set of fresh eyes on a situation threatening relations between the US and Russia. Ryan doesn't believe it's the Russians who're responsible for a missing nuclear warhead gone missing from one of their facilities and the film becomes a race against time as our intrepid hero tries to get to the bottom of the theft, while preventing a nuclear holocaust. Clancy's novel had the villains as Islamic extremists, but the movie alters them to be a shadowy group of Neo-fascists. This film was in production before 9/11 and, according to screenwriter Daniel Pyne, the villains were altered to avoid clich�s. It was a decision that robs the film of some much-needed credibility because nothing else about the film feels footed in reality, either. So what we're left with is a hokey thriller that desperately tries to toss its hat into the ring with the big boys in the series, and instead comes off like a little bother that's just too slow to play with the other kids. It's not the political correctness that sinks this film entirely. Director Phil Alden Robinson does a great job of ensuring there's no tension, not even during the film's oft-touted centerpiece. For a film that's essentially a race against time, it's a staggering bore. The cast is lousy, too. Morgan Freeman phones it in as Ryan's mentor, Philip Baker Hall does little except scowl for the camera and Liev Schreiber sleepwalks though the entire film. He's playing the same part that Willem Dafoe took on in Clear and Present Danger, only he does so without any heft or authority. Surprisingly, it's Ben Affleck who comes off the best. The script calls for a different Jack Ryan than either previous actor had portrayed and Affleck does a fine job of conveying the greenish nature of the character. He's not a good enough actor to carry this stinking mess of a film (though to be fair, I don't think anyone could've saved this joke of a script), but he's the least of the film's problems. It's all wrong: The pacing, the lack of a convincing villain, zero emotional weight and, of course, dollops of politically correct screenwriting. What really sickens me about The Sum of All Fears is that is could've been the best of all the films with a different creative team at the helm. I'm not sure why Paramount felt the need to reboot the franchise, with the previous Jack Ryan film grossing over $200 million worldwide and garnering some acclaim to boot, but here you go. The end result was a successful film at the box office, but a thoroughly miserable and stupid viewing experience. Image Transfer Review: For a film only six years old, it's strange to see such a flawed image. Did this print really require this much digital processing? The DNR isn't quite as obvious as in Paramount's previous Jack Ryan discs but I did find there to be a suspicious lack of detail in certain scenes. Furthermore, our old friend, edge enhancement, rears its ugly head here as well. I only spotted it during a handful of scenes but it's there. The image isn't a total loss, however. It's a detailed transfer but ultimately never as good as it could, or should look. Audio Transfer Review: The disc spouts an aggressive True HD track. Sound effects are powerful and occupy your rear speakers, creating an all-encompassing mood for the events of the film. The dialogue is occasionally a bit on the soft side, but it remains clear for the most part. This is pretty standard stuff as here, and successfully recreates an effective audio mix. 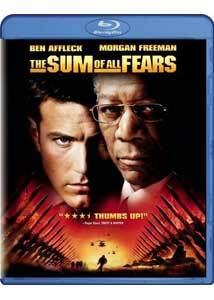 Extras Review: The Making of The Sum of All Fears (29m:55s) is a solid production feature covering all aspects of production. It's even reveled that Harrison Ford had declined to do another Jack Ryan film (damn you, Ford!). My only qualm is that the documentary consists mainly of congratulatory comments ("it was great working with this one", "this guy is SO smart!") that become a bit repetitive. Creating Reality (27m:12s) is a dull and lifeless production that examines the creation of the action sequences. It's mainly all about the wonders of CGI. Nothing we haven't seen before. Robinson and Lindley's commentary is an average track. Robinson seems like one hell of a nice guy, so much so that I feel a bit guilty for trashing his film so mercilessly. It's a fairly standard discussion with nothing out of the typical here. Fans of the film might enjoy the listen, though. Robinson and Clancy's commentary comes last but not least. For my money this is the most enjoyable aspect here. It begins with a great line from the novelist: "I'm Tom Clancy, I wrote the book they ignored." It really makes me wish that Clancy had been involved in the special editions of the previous movies, as I know he wasn't crazy about the casting of Ford, either. As I wasn't a big fan of The Sum of aAll Fears either, I found this to be a great and rewarding experience. Tom Clancy rules! The theatrical trailer (in HD) rounds out the bonus content. Oddly enough, Paramount�s Sum of All Fears Blu-Ray isn't any better than the other high definition Jack Ryan titles. The recent print is over-processed and littered with DNR. I cannot, in good conscience, recommend giving this film a buy, but my qualms aren't entirely with the transfer. Like the other Paramount Jack Ryan Blu-rays, they're serviceable. If this title has any fans the Blu-ray is a worthwhile investment, I suppose, although it's somehow more disappointing to see such an inconsistent transfer for such a recent film.